Last month Humble Beast artist Foreknown dropped his debut album, named Ornithology. Read our review here. We called it the most intelligent album of the year so far due to its clever wordplay, storytelling, and balanced mix of humour and deeper themes. We recently had the pleasure of speaking at length with Foreknown about the release, his love of pop culture, and why birds play such a big part of Ornithology. SAM: Where in the world do I find you today? FOREKNOWN: I’m currently living in Phoenix, AZ. I’ve been out here for about 10 years. I grew up in the Los Angeles area though, so that’s my home planet. By next Summer I’m hoping to be living in Portland, OR though to start a new chapter in my life. First thing’s first, do you love birds? Throughout the process of writing and recording Ornithology I started learning more and more about them. You could say I’m becoming a bit of a “Bird Nerd”. They are absolutely fascinating creatures. If anyone wants to get blown away by the bird world, I suggest reading a book called The Thing With Feathers: The Surprising Lives of Birds and What They Reveal About Being Human by Noah Strycker. Have any ever lived in your beard, as the album cover might suggest? No. Not that I know of. Anything is possible. Once I was running my fingers through my beard and I felt something wrapped up in there. I pulled it out and it was a bee! A live bee! I have no idea how long it was in there. He must have been flying along minding his own business and next thing you know, he’s trapped in this wiry, black, web of fear. Poor guy. Can you briefly tell me how you became a Christian, and how hip-hop fits into the picture? How long has Ornithology been in the works for? Some of the songs I’ve had since I joined Humble Beast in 2009. Other songs I wrote the week I was recording the album. So I’d say the album has been slowly coming together for five years. Where did you record it? What was it like to work with the producers on this record? A couple of tracks I recorded here in Phoenix, but the majority of the album was recorded at the Humble Beast Studios in Portland. Working with the producers was amazing. The Bridge, Beautiful Eulogy, and Alert312 worked really hard to craft a sound that would work with my style. I’ve never made a beat in my life so watching these guys work was like watching some crazy type of sorcery. Every single beat on this album spoke to me and told it’s own story and it was really fun to lyrically fill in the blanks. What’s it like being part of Humble Beast? Does the aim of the label help to shape the album? I have been with Humble Beast for five years and I couldn’t imagine being anywhere else. I am a big fan of the other artists and I think that all of the releases are excellent. I still sometimes have a hard time understanding how I ended up being a part of this. Because of their musical aptitude, they have been able to craft a sound that both nurtures and amplifies my own. Because of their discipleship, I have seen myself gain a better understanding of the gospel. I’m extremely blessed. You have this incredible mix of silly and serious on Ornithology. Was it hard to get the balance right? Not at all. That’s just me. I don’t think I’ll ever do an album that’s just silly or just serious. I normally don’t come up with concepts before I write a song. I listen to the beat and start writing and what comes out is what comes out. Sometimes I’m surprised at how serious a song comes out when I intended for it to be lighthearted and vice versa. For this album, I think the mix works out especially if you’re listening from beginning to end, straight through. Credit for the track order goes to Braille. I think he arranged it in such a way that the album as a whole tells a really good story. Why did you decide to go with the whole bird theme on the record? It’s very clever. I’d love some insight. What bird theme? Kidding! My wife and I both work at a school. We love our jobs but we have a lot of time off. A lot of UNPAID time off. When you’re a kid you never really understand why grown-ups stress about money so much, but financial woes, no matter how small, can really mess you up. There was less sleeping, more bickering, and more anxiety about how we were going to make it. We realized that by hanging onto these anxieties and allowing them to rule our lives, we were not trusting in God. Matthew 6:26 had become a very important verse in my household. We would find ourselves stressing and we’d remind one another to “Consider the birds”. I knew that I wanted to convey that in a song and since I had already written The Truth About Flight, Love, and BB Guns that a bird themed album just seemed like the way to go. I feel as though this record is a window into your love of pop culture. What’s the story behind The Quartermaster? When I was growing up video game consoles weren’t what they are now. You couldn’t get top of the line gameplay unless you went to the arcade. This was the 80’s and early 90’s I’m talking about. There was an arcade in every mall. There is something magical about the bombardment of lights and sounds you experience when you walk into an arcade. To this day you will never see me pass a Ms. Pac Man cabinet without playing at least one round. I’m currently in the beginning stages of building my own arcade cabinet and I could not be more excited. I love my XBox 360 and my PS3, but there really is no experience like the arcade experience. There’s some bold statements on Bird in the Hand (feat. JGivens). How do you see greed and materialism endangering Christians both individually and corporately? The problem is that we are being sold this lie that with enough money and possessions we can have heaven here on earth. That God only wants for us to be happy, and if we find ourselves impoverished it is because of our lack of faith. People buy into this? Talk to me after you thread your camel through a needle. Greed kills and it is insatiable. We also get some glimpses into your family life, and on Minivan, your sweet, sweet ride. There’s great wordplay on that track, were you just trying to have some fun? Definitely. There are so many songs out there about Lamborghinis and Bugattis. I wanted to write about my dream vehicle. If I could have any vehicle in the world, it would be a Chrysler Town and Country. And #FootyPajamaPizzaDanceKaraokePartyGo! is another parody song about your wild family nights. I bet your kids must love that track? I think they did at one point. They’re pretty over the entire album by now. You can only hear your Dad’s voice so much in a day, ya know? Is this your perfect night in? And are you a gun at Monopoly? Dude. I KILL at Monopoly. I’m actually so good that I sometimes get accused of cheating. It’s at that point I flip the board because I won’t stand for those types of accusations. Yeah…we don’t play Monopoly much. It’s clear that you love family life, but title track Ornithology appears to be a challenge to yourself about complacency and comfort. Is that correct? Ornithology is my ode to Matthew 6:26. This passage always comforts me when I find myself stressing and worrying. It’s so freeing to say “I don’t really see a way out of this but I’m not going to stress because God’s got this. He’s got me.” Whenever I find anxiety trying to get a foothold, I know I need to say “Ornithology”, give it up to God, and find joy in the fact that he is good, right, and perfect so I don’t have to worry. There’s a number of tracks that deal with sin and you illustrate these stories so well. I understand some are made up and others come from your life. Can you tell me more about these tracks, and how hard it is to be transparent on a record? I love using my words to paint a picture. My favorite is when the story takes on a life of it’s own and goes a completely different direction than what I intended. For example, on the song Cathartes Aura (Vulture), I intended to write about a guy being victimized by a promiscuous girl. As I was writing though, the story started to play out in my mind and I was watching the reality of the situation unpack itself right in front of me and I was like “Wait a minute! She’s not the vulture! It’s him! He’s the vulture!”. I love when God flips it up on me like that. As far as transparency goes, that has always been such an important part of my music and is even one of the key principles Humble Beast was founded on. When someone puts on Ornithology, I need them to know what I’m about and where I come from so when I tell you that Christ comforts the hurting and saves the lost, you can see that evidenced in my life and know I’m speaking truth. The album closes with a bang on The Never Haves. It hits hard as it reflects on the suffering of Jesus. Can you tell me how this track came together, and why you chose it to close the album? I just find myself complaining about the most insignificant things sometimes. My internet is too slow, I don’t want to go to work today, McDonalds only gave me three barbecue sauces when I specifically asked for four. Then other times I’ll find myself upset about past hurts that carry a bit more weight. Divorce, being bullied, financial woes. But even the most hurtful, traumatic experiences in our lives could not compare to the suffering Christ endured on our behalf. When I remember that, I get slapped in the face with my selfishness every time. I figured others might need that same wake up call, and hopefully that call leads us to a place of repentance, surrender, thankfulness, and joy. Being part of Humble Beast, this album is available for free. Is it a joy to give it away for free? Very much so! I love the “Freely Given” model. I want to get the gospel message into as many hands as possible and I never want money to be a barrier that would keep someone from it. Is there a big idea or key message to Ornithology? I would say that the overarching theme of Ornithology is identity. We are all desperately trying to find out who we are and what our purpose is. Unless we are putting our identity in Christ, we will always search, and always lack. We’ll see. I’m not quite sure. Remember, this is my debut album so this is all new territory for me. With a lot of people just discovering my music, I’m having a great time building relationships. I just want to continue to grow in the Lord and joyfully receive whatever he has in store for me, my family, and my ministry. I’m also doing a 24-hour video game marathon in October, so there’s that. Might the next album be themed around another animal? If so, which? Maybe I’ll look under the sea for inspiration. What’s a better album title… Vicious Fishes or Selfish Shellfish? 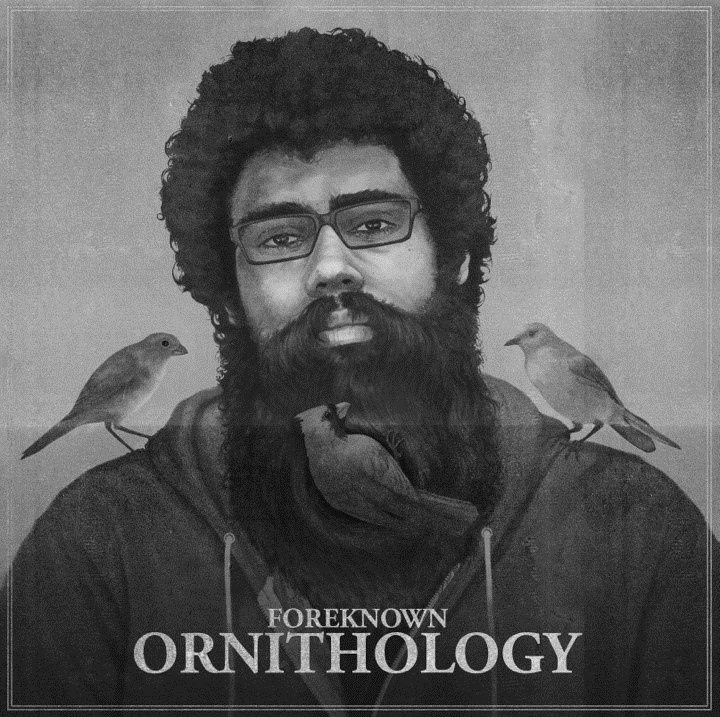 Ornithology by Foreknown is available now as a free download at Humble Beast. If you’d like to support Foreknown’s ministry you can purchase the album on iTunes. Read our review of the album here. Posted in MusicTagged christian, Foreknown, Humble Beast, Interview, OrnithologyBookmark the permalink. Very nice, in-depth interview! Thanks for that. Album Review: for KING & COUNTRY – Run Wild. Live Free. Love Strong.